WonderSlim Review: Do WonderSlim Claims Are Credible? WonderSlim is a meal replacement program that helps individuals to lose weight using simple techniques that are believed to work in the long run. The manufacturer of the program claims that it is wonderful option for those who want to lose significant weight in a healthy way. WonderSlim is an easy diet program that does not require thorough planning for it. WonderSlim manufacturers have nutritional products that individuals can rely on when trying to shed weight. Its ingredients include low-calorie foods, milk shakes and desserts that can be ordered from the WonderSlim official website. 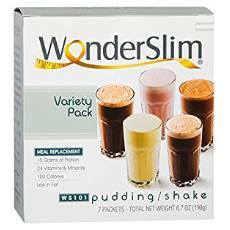 WonderSlim offers a variety of products that include pasta, protein shakes and diet pills. Whey Protein Concentrate – It provides the user with amino acids. It also eases the process of digestion. Calcium Caseinate – It is a slow acting source of protein that lasts for longer than other forms. It is digested slowly hence, it is a steady source of amino acids. The main aim of WonderSlim diet program is to help individuals shed weight without straining. All this is achieved because of the low-calorie meals, milk shakes and desserts. This program is different depending on whether you are a man, woman or nursing mother. Users of this program have to choose different starter kits after which they will be given a package inclusive of a plan and daily foods that need to be consumed during a month’s period. The users have a right to choose their food preference based on a food selection list and shopping guide. This helps them avoid consumption of meals provided only by WonderSlim. Users of WonderSlim program may lose weight without extreme physical strain. These users have an option to choose from when it comes to various meals. The products in use add nutritional value to the users. The users are not restricted to WonderSlim products only. It is very expensive following the diet program for the long-term. Poor taste of the food makes it hard for users to consume the meals. The Users get sick while some are discouraged because of the plain and tasteless foods. There can also be some ingredients that may trigger allergic reactions. Is WonderSlim Good For You? While a few individuals have been discouraged because of the cost, some users pursue it. WonderSlim program is beneficial to individuals who are determined and have set a goal to achieve. It may not be beneficial to every individual. Diet Direct Company owns WonderSlim. This is a company that was formed in 2001 with an aim of helping individuals shed weight by providing them with low-calorie and high protein products. WonderSlim program has one role which is to help its’ users lose weight in the easiest and simplest ways possible. It is not the only program offered for weight loss, as there are many other cheaper options. It may be expensive because of its four-week period term but it is effective and efficient. WonderSlim has proven to be a candid brand, as it has become a go-to website for individuals for want products that will help them lose weight. These products from the WonderSlim program have the following key factors; have quality when it comes to ingredients, they are effective, they increase metabolism in the body, helps the users to meet their weight loss goals and finally they promote appetite suppression. You may need to research more on the effectiveness and safety of these ingredients before you try them out.